There are a variety of prostate disorders that commonly afflict men. The most common prostate disease is benign prostatic hyperplasia (BPH), a noncancerous condition that results in the enlargement of the prostate. This condition occurs in approximately 70 to 80 % of men as they reach their 70s and 80s. A more serious prostate problem is prostate cancer. It is the most common cancer in elderly men and the second most common cause of cancer-related death in men. Another predominant prostate disorder is prostatitis or inflammation of the prostate. It may be classified as bacterial or non-bacterial based on the causative organism. The probability of acquiring these diseases increases with age. Taking good care of the prostate gland early on would significantly help in the prevention of such diseases later in the patient’s life. 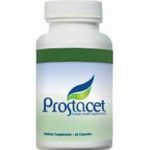 Prostacet is a natural prostate supplement especially formulated to keep the prostate gland healthy. At the price of $49.95, men can be in control and maintain their prostate health. Prostacet is made up of essential and powerful ingredients necessary in maintaining the normal morphology and function of the prostate gland. It can be bought online on the Official Website. Saw Palmetto Extract Suggested to reduce the amount of dihydrotestosterone (DHT, an active form of testosterone), and inhibit growth factors that can cause improper enlargement of the prostate. Lycopene Extract Has potent antioxidant effects and scientifically proven to be connected with protection against prostate cancer. Zinc Chelate Necessary for normal growth, development and functioning of the reproductive organs. Vitamin E An antioxidant that protects the cell membranes and other fat-soluble parts of the body. Selium Activates the antioxidant enzyme – glutathione peroxidase, which is capable of improving the ability of the body to defend against cancer. Beta-Carotene Known as an antioxidant and an immune system booster. Corn Silk Extract A mild diuretic which helps in the proper flow of urine. Echinacea Angustifolia Root Has been suggested to improve the immune system by activating white blood cells. Nettle Leaf Possesses anti-inflammatory effects. Cranberry Extract Possesses an anti-adherence action that may reduce the ability of certain bacteria to cause UTI. Parsley Extract Promotes good digestion and supports the liver, kidneys, and bladder. Cayenne Pepper Improves the effects of other herbs and is also a good source of Vitamin A, Vitamin C, Iron, Calcium and Potassium. Curcumin Extract Known to be a strong antioxidant. It decreases inflammation by lowering histamine levels, protects the liver against some toxic compounds, and promotes proper circulation. Dihydrotestosterone (DHT) is primarily responsible for prostate development and one of the causative agents in the pathogenesis of prostatic diseases. Increased DHT production would result in an abnormal enlargement of the prostate gland, which may lead to benign prostatic hyperplasia or worse to prostatic cancer. The primary action of Prostacet, specifically the saw palm extract, is to inhibit the production of DHT in the prostate gland thereby reducing its concentration. It has also been found out that saw palm extract has a down-regulation effect on inflammatory-related genes and substances that promote abnormal cell proliferation. In addition to these inhibitory mechanisms, Prostacet is also able to promote apoptosis or programmed cell death with the action of saw palm extract and lycopene. With these properties, it has been concluded that saw palm extract may be useful in the prevention and treatment of prostate cancer and benign prostatic hyperplasia. The other ingredients in Prostacet are all beneficial in the promotion and maintenance of overall prostate health. Prostacet, with the presence of strong antioxidants, is able to effectively combat free radicals and other damaging substances. Furthermore, it is able to facilitate and maintain proper urine flow, and prevents bacterial propagation in the urinary tract which may lead to prostatitis. The primary advantage of Prostacet is in its effectiveness. It is effective in the sense that the key nutrients essential in maintaining prostate health are all present in this supplement. The supplement is also fast-acting, providing significant results in a short span of time. Additionally, this excellent food supplement would not only take care of your prostate, it will also promote your overall body health. Remember that Prostacet contains antioxidants and immune boosters which are necessary in having a healthy body. Prostacet also contains lycopene, which is not present in other prostate supplements. Prostacet is taken orally and the recommended dose is 2 capsules per day, one in the morning and one at night before bed. To achieve the best result, avoid coffee, soft drinks, alcohol and other highly acidic products. In the presence of extreme discomfort, it can be taken in the dose of 4 capsules daily. What Kind of Reviews are Out there for Prostacet? Prostacet may be considered one of the best supplementation options in the promotion and maintenance of prostate health. It basically boosts of having all the key ingredients that can help maintain the normal morphology and functioning of the prostate gland. As an added bonus, it also contains vitamins and nutrients beneficial for the human body as a whole. Prostacet is one of the best prostate supplements available in the market right now. Not only is it effective, but it is also efficient. Efficient in the sense that customers are sure to get their money’s worth and much more with the overflowing health benefits of taking in Prostacet. I bought Prostacet for my uncle when he was having problems waking up consistently during the night to go to the toilet. It is working well. He has been taking it for just a few weeks and I’ve noticed he is not running to the restroom so much. He says he gets up much less in the night, and sometimes not at all! I am 53 years old and was frustrated with nightly trips to the bathroom. I was looking for a prostate supplement and found Prostacet. It works great as I can already see the improvement with fewer bathroom trips. I am feeling much better since taking it. Now I sleep all night comfortably. It solved one of my most irritating problems. Best prostate supplement I have used by far.